Exciting news: you can get "Matches" on vinyl now! 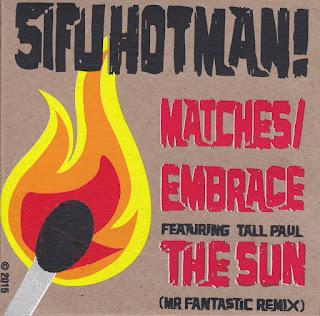 If you don't know, SIFU HOTMAN is a side project featuring me, Dem Atlas, and Rube. We put out an album in 2014, while I was between projects and also kind of right before Dem signed to Rhymesayers. Luckily, it didn't fall between the cracks; our song "Matches" got featured on BBC Radio 6, and then as the "weather" on an episode of the wildly popular podcast Welcome to Night Vale, leading a whole bunch of people to discover the project. Incidentally, "Matches" might also be my favorite song I've ever been part of, so it's been really beautiful to see so many people from around the world connect to it. The Sifu Hotman album is general just turned out so fresh; we're all known for doing weirder, outside-the-box stuff, so a whole project of boom bap throwback hip hop and punchlines is something I'm really proud of and happy we got to put out. And Rube, our producer and DJ, ALSO screen-printed all of the sleeves. They're gorgeous. You can get the vinyl through our Bandcamp page. If you're in Europe, it might be cheaper to buy it through the UK label that's putting it out: AE Productions. Quick note-- it is the radio edit on the single, in case that impacts whether or not you want it.